Type 2 Diabetes Mellitus is a metabolic disease characterized by hyperglycemia due to defective insulin secretion, insulin action or both. It is the defective insulin action or Insulin Resistance that is one of the greatest challenges in Diabetes management. Traditionally our thinking has been that it is the chronic glucose elevation of diabetes that leads to the damage and dysfunction to the kidney, eye, nerves and blood vessels. We are now realizing that the risks and damage may start years before blood glucose levels rise above normal. There is currently an epidemic of Type 2 Diabetes throughout the world that is rapidly worsening, the number of cases in Canada is expected to double between 2000 and 2010. The cost in lives lost and the financial cost of dealing with the medical complications of diabetes is staggering. It is only by understanding and developing effective treatment for Insulin Resistance that we can hope to deal to this threat to our lives and health. Insulin resistance is the earliest detectable abnormality in pre-diabetic individuals. Insulin resistance may start years or even decades before the diagnosis of diabetes is made on the basis of a fasting plasma glucose greater than 7 mmol/L or a casual plasma glucose of greater than 11 mmol/L. The difficulty is that we really don’t have any easy way of identifying and measuring insulin resistance. The only reliable measurement of insulin resistance is the hyperinsulinemic euglycemic clamp which is complex and costly. We have tried other models of measuring insulin resistance such as the HOMA-IR model which relates fasting glucose levels to fasting insulin levels but this test has considerable variability and has not been useful in clinical practice. Insulin resistance is defined as an impaired biologic response to either exogenous or endogenous insulin (12). Insulin resistance by itself does not cause diabetes. As long as the pancreatic beta cell can compensate for the insulin resistance by producing more insulin; glucose levels will remain normal. It is only when the beta cell becomes impaired and insulin secretion is inadequate to compensate for insulin resistance that glucose levels rise. Initially there may be adequate insulin production in the fasting state but an inability for the pancreas to cope with the stress of high carbohydrate intake resulting in post prandial hyperglycemia. This stage may be diagnosed by an elevated 2 hr glucose on the standard glucose tolerance test that is above 7.8 mmol/L but below the diagnostic value of 11.1 mmol/L for diabetes mellitus. This stage is known as impaired glucose tolerance and is a precursor of Type 2 Diabetes. Initially insulin resistance is compensated by hyperinsulinism; as the beta cell becomes exhausted and can no longer keep up, we develop impaired glucose tolerance (IGT). As the insulin secretory defect progresses, glucose levels rise still further and when the fasting plasma glucose level exceeds 7 mmol/L or the after meal glucose level exceeds 11.1 mmol/l, we say that diabetes has been diagnosed. The diagnosis of Diabetes is based on a glucose level but the disease that caused this glucose level has been present for years. The first manifestation of disease has been insulin resistance and elevated serum insulin levels. In 1988 Gerald Reaven recognized a cluster of risk factors commonly present in individuals with high insulin levels (Reaven G. Role of insulin resistance in human disease. Diabetes 1988; 37: 1595-1607). This was initially referred to as syndrome X and is characterized by hypertension, obesity (particularly abdominal), high triglyceride, low HDL and impaired glucose tolerance. Insulin resistance is the common denominator of the syndrome. In 1998 the World Health Organization called this The Metabolic Syndrome. Individuals with the metabolic (insulin resistance) syndrome are at dramatically elevated risk for diabetes, ischaemic heart disease, stroke, kidney failure, blindness and nerve disease. People with diabetes have up to four times the risk of developing ischaemic heart disease of age matched non diabetics. So that we don’t have to be eating constantly in order to keep on living, the body (primarily the liver) is capable of producing glucose (gluconeogenesis) from amino acids, lactate, pyruvate and glycerol. The liver can also store glucose as the polymer glycogen and release it as needed. Liver glucose production of 2 mg/kg/min balances glucose uptake by the other cells of the body. Glucose production and release are stimulated by catecholamines (epinephrine & norepinephrine) and glucagons while liver glucose production is suppressed by insulin. Insulin stimulates production of triglycerides from free fatty acids and glycerol. In the fasting state when insulin levels are low, triglycerides are broken down by lipolysis to free fatty acids and glycerol. The catecholamine stress hormones also break down triglycerides. Free fatty acids can be oxidized in the mitochondria to provide energy. Protein metabolism consists of breakdown of protein to amino acids and synthesis of protein from amino acids. In times of need, glucose can be synthesized from amino acids. Insulin inhibits protein breakdown and stimulates protein synthesis while glucagon and low insulin levels favour protein breakdown. Initially there is a decrease in insulin stimulated glucose metabolism. That is to say, a fixed quantity of insulin causes less glycogen formation than normal. The action of the enzyme (glycogen synthase) that forms muscle glycogen is impaired. In the normal individual, hepatic glucose production is suppressed by insulin. In susceptible individuals there is impaired suppression of hepatic glucose production by insulin. In the early stages, the decreased glucose disposal (from decreased glycogen formation) and the increased glucose production (by the liver) are compensated by increased insulin production by the pancreas so glucose levels remain normal. As the disease progresses, the pancreatic beta cell production decreases and and is unable to keep up with the body's needs in times of stress. The production of insulin cannot keep pace with acute needs and and initially early phase insulin secretion is lost. The loss of first phase insulin secretion leads to post prandial hyperglycemia. As the condition progresses with time, post prandial glucose levels increase, when these levels reach the level of 9 mmol/L we say that the individual has impaired glucose tolerance, and when the post prandial level exceeds 11.1 mmol/L we diagnose Diabetes Mellitus but these levels are mere points on a continuum of dysfunction that first started years or decades earlier with decreased glycogen production leading to decreased glucose disposal. The transition from normal glucose tolerance to IGT and to Type 2 Diabetes is a reflection of the deterioration of the function of the pancreatic beta cell (2). Insulin resistance can be triggered by obesity, pregnancy, aging or infections. Obesity and particularly abdominal obesity is associated with decreased levels of insulin mediated glucose uptake but is the obesity the cause or the effect of insulin resistance (3). Abdominal fat tissue could provide a chain of events leading to skeletal muscle insulin resistance which appears to be the first step in the cascade leading ultimately to Type 2 Diabetes. There are certainly genetic factors in the development of Type 2 Diabetes and the first of these may be the genetic factor for abdominal obesity (4). Another factor is possibly the “Thrifty Gene”. This is a genetic adaptation which would enhance survival in individuals living in an environment of frequent famine. (5). In times of plenty this genetic background could become detrimental, leading to increased free fatty acids and intra myocellular lipid with insulin resistance. Low birthweight is also a risk factor for development of insulin resistance and diabetes mellitus (6). It is unlikely that a single genetic variant is the cause of insulin resistance and type 2 diabetes. It is more likely that there are multiple genetic and environmental factors. Not only elevated insulin and glucose levels but also elevated free fatty acid levels are characteristic of the insulin resistance syndrome and type 2 diabetes mellitus. We know that the risk of microvascular disease (retinopathy, nephropathy, neuropathy) increases directly with glucose levels and this is one reason why the diagnostic levels of glycemia were changed in the 1998 CDA guidelines for diagnosis of Diabetes. The old fasting glucose level for diagnosis of diabetes had been 7.8 but at this level 20% of newly diagnosed diabetics already had microvascular disease. What tends to be less well known is that the threshold of glycemia for development of macrovascular disease is much lower. The Honolulu heart study showed that the risk of ischaemic heart disease was elevated at post prandial glucose levels of above 5.2 mmol/L . We have defined glycemic levels for the diagnosis of diabetes on the basis of microvascular disease risk, if instead we had used the risk for macrovascular disease our dignostic levels would be much lower, probably a fasting glucose of about 4 mmol/L and a post prandial level of 5 mmol/L. Most people with insulin resistance already have elevated glucose levels though they may not yet be in the diabetic range, this increased level of basal glycemia increased the risk for ischaemic heart disease. The major cause of death in type 2 diabetics and in people with impaired glucose tolerance is ischaemic heart disease. The cardiac risk of type 2 diabetes is the same as having had a previous coronary event (7). Individuals with insulin resistance and type 2 diabetes have abnormal lipids including elevations of triglycerides and low HDL (8). In the United Kingdom Prospective Diabetes Study (UKPDS) (9), men with diabetes had elevated triglyceride levels and lower HDL compared to control while women had the same elevated triglyceride values and low HDL but they also showed higher LDL than controls. The composition of the HDL and LDL particles is also different in subjects with insulin resistance, IGT and type 2 diabetes with a decrease in particle size of both HDL and LDL. The decreased particle size of the HDL confers less protection against heart disease while the smaller denser LDL particles are more easily oxidized and are more atherogenic (10). In insulin resistance and type 2 diabetes there is enhanced clotting and inhibited clot breakdown which explains the increased risk of acute coronary occlusion and myocardial infarction. There are increased levels of fibrinogen, plasma activator inhibitor-1 (PAI-1), factor V and D-dimer; all of which contribute to enhanced thrombogenesis as well as decreased fibrinolysis (11). Platelet abnormalities are also seen with an increased sensitivity to aggregation. The platelets are more sensitive to aggregating agents such as epinephrine, thromboxane and thrombin as well as having increased glycoprotein receptors (11). Insulin resistance contributes to endothelial dysfunction by stimulating smooth muscle cell proliferation, stimulating growth factors, increasing formation and decreasing regression of lipid plaques and by stimulating connective tissue synthesis. Insulin resistance contributes to insulin induced hypertension by enhancing renal tubular reabsorption of sodium and increasing the tone of the sympathetic nervous system. The result of these lipid, glucose and hemostatic abnormalities results in increased risk of coronary heart disease and worsens the prognosis following a coronary event. 50% of type 2 diabetics will die from coronary ischaemic events and of those that suffer an MI, 44% will be dead in the next year. Treatment of insulin resistance is therefore of paramount importance in decreasing morbidity and mortality. 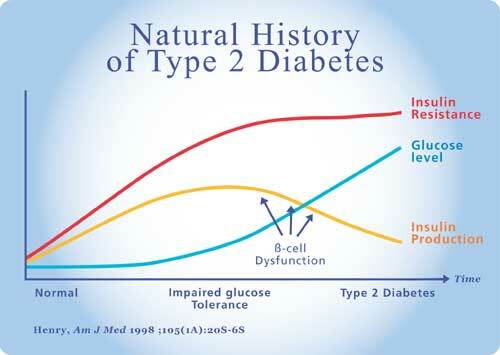 Insulin resistance is the first abnormality seen in the individual who will develop type 2 diabetes. Initially there is hyperinsulinism but as the pancreatic beta cell is no longer able to produce the increased amounts of insulin needed for glucose control; relative insulin deficiency results and glucose levels start to rise. When a critical plasma glucose level is reached, we diagnose diabetes. The hyperinsulinism and the cluster of related symptoms such as hyperlipidemia, obesity, hypertension, hypercoagulability and microalbuminuria lead to increased risk of death and illness. Logically we should direct our treatment to the reduction of insulin resistance. Exercise: Exercise is one of the most effective means at our disposal to increase non-insulin dependant glucose transport. Exercise is therefore one of the cornerstones of treatment of type 2 diabetes. Diet: Even a modest weight loss of 5% of total body weight can lead to a significant improvement in insulin resistance and glycemic control as well as improving lipid profile and lowering blood pressure. In the UKPDS, few subjects were able to maintain a HgbA1c below 7% by lifestyle measures alone and with time there was a inexorable progression to higher glucose levels as pancreatic beta cell function declined. Almost all diabetics will need drug therapy with time. The study of De Vegt has shown that almost 65% of patients with both IGT and IFT will progress to diabetes over a 6 yr period (14). Pharmacologic treatment: The object of pharmacologic treatment should be to improve insulin resistance and to reduce glucose levels. Drugs that increase pancreatic insulin production: Drugs such as the sulphonylureas or meglitinides that increase insulin production should be avoided unless insulin deficiency predominates. Drugs that suppress hepatic glucose production: The biguanides and thiazolidenediones. (metformin & the glitazones, rosiglitazone & pioglitazone). Metformin predominantly works by decreasing hepatic glucose production especially nocturnal gluconeogenesis. These drugs all improve insulin resistance but the glitazones are more effective for this. Metformin use is not associated with weight gain but GI side effects frequently limit the dose that may be used. Metformin is recommended in the obese patient. If a normal fasting glucose cannot be attained using metformin alone, then another drug needs to be added. Drugs that slow intestinal absorption of carbohydrate: The alpha glucosidase inhibitors (acarbose), impair the breakdown of disaccharides and starches in the proximal portion of the small bowel. The sugars and starches must be broken down to monosaccharides before they can be absorbed though the bowel wall into the blood. The action of acarbose will delay but not prevent absorption, thus there is more time for glucose disposal from the blood and high post prandial glucose peaks may be avoided. Since the sugar and starch load is carried further down the GI tract there is more time for fermentation and thus abdominal cramps and gas may limit utility. This class of drugs is particularly helpful in the early stages of diabetes when HgbA1c levels are only modestly elevated and small decreases in blood glucose are needed to bring glycemia to goal levels. The usual HgbA1c improvement expected is only about 0.5% so the drug tends to be less helpful in patients who are already on a maximum dose of other meds and have HgbA1c values above 8 mmol/L. In the STOP NIDDM trial reported at the EASD meeting in September 2001, acarbose given with meals to individuals with IGT decreased the conversion to type 2 diabetes over a 5 year period. Drugs that improve glucose uptake and utilization in adipose tissue and muscle, thereby reducing insulin resistance: The thiazolidinediones or glitazones, rosoglitazone and pioglitazone. These drugs are stimulate the peroxisome proliferator-activated receptor gamma. This leads to enhanced production of the target genes which are involved in carbohydrate and lipid metabolism. Levels of Glut-1 and Glut-4 are increased, these are glucose transporters which transport glucose across cell membranes. Increasing of Glut-1 and Glut-4 increases glucose transport. Insulin signaling is also increased by increases in IR tyrosine phosphorylation, increases in IRS-1 tyrosine phosphorylation, increases in Phosphatidylinositide 3 kinase, and decreases in Tumour Necrosis Factor alpha action. Glucose formation is decreased by decreased levels of Phosphoenolpyruvate carboxykinase. There are also lipid effects with increased Lipoprotein lipase activity leading to increased triglyceride breakdown and increased Phosphodiesterase 3B leading to decreased intra-adipocyte lipolysis. The enhanced glucose transport leads to decreased glucose levels and increased glycogen formation. It is known that elevated plasma free fatty acids which are seen in insulin resistance and type 2 diabetes impair glucose transport. The glitazones impair breakdown of triglyceride leading to lowering of plasma free fatty acids and therby improving glucose transport. Increased free fatty acids also lead to increased liver gluconeogenesis and decreased glycolysis so the decrease in FFA decreases gluconeogenesis, increases glycolysis and lowers plasma glucose. By decreasing hepatic phosphenolpyruvate carboxykinase (PEPCK) the glitazones reduce hepatic insulin resistance.